Menhir of Carnac is an ancient religious complex in the region of Bretagne, located in western France. Menhir are generally oblong stones, stuck alone in the ground or forming long paths that are supposed to be associated with the cult of the dead. The height of the stones ranged from 1 to over 20 meters and the largest menhir is located precisely in Carnac. It consists of a total of 2813 stones arranged in 13 lines. According to some information on prehistoric stone blocks here are over 3000. 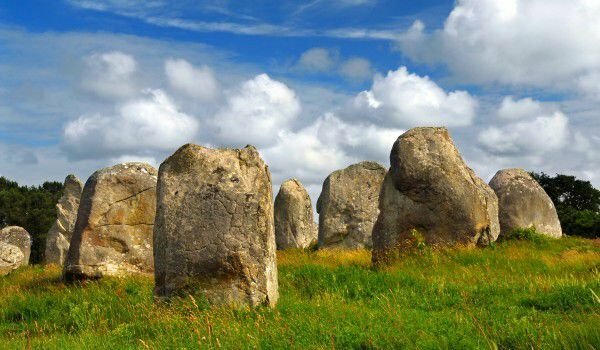 Stones of Carnac are megaliths and dolmens are actually only one single menhir. Rocks extend in a north-easterly direction north of the city. Over the centuries, this prehistoric complex has been repeatedly robbed, suggesting that in the past it was much more massive. Today Menhir of Carnac was declared a national monument and is protected by the French State. Carnac itself is an extremely pleasant town, blessed with beautiful beaches, where everything necessary for a maritime rest. However, there is no way one can miss the cult complex on the outskirts of the village. It can be easily reached, the tourist office in town gives clear guidance for tourists. Access to the menhir, however, is limited, especially during the summer months in order to protect the blocks from erosion and the prevention of additional factors for the destruction there. The complex, however, can lead to certain observation points, which offers a pretty good view. Menhir appear in the Neolithic Age in Europe around 4000 BC, at the same time in Africa were built the first Egyptian obelisks. Menhir in Carnac were formed from 4500 BC to 2000 BC The exact date of construction and placement of the rocks here is quite difficult to determine because little material is found in them and who can speak for archaeological plasticity. It is assumed that most mehirs are dating from 3300 BC, but certainly some are more than six millennia old. Most likely, cult complex Menhir in Carnac is a kind of necropolis. Here people have spent stones in honor of their ancestors. Stones of Carnac are so many paths that some even reach the beach. Most of the stones were carved in the shape of huge geometric symbols. Today, erosion, climate impacts, and looting throughout the centuries for the construction of various buildings in the region have withdrawn from the grandeur of the whole complex. Quite often menhir are in the shape of a triangle, which in ancient mythology symbolizes cosmic harmony. In the culture of Celta triangles represent the symbol of the three phases of development of all people and for Christianity, this geometric symbol is associated with Trinity. Menhir in Carnac today is conditionally divided into three main groups of stone rows - Ménec, Kermario and Kerlescan. In Ménec has 11 lines with a total of about 71 stone blocks, at the west end they are pretty destroyed. The largest menhir here reaches a height of 4 meters and the smallest around 0, 6 meters. In Kermariov we can see 1029 stones arranged in a total of 10 lines. In the East remains a sanctuary Kerlescan, which consists of around 555 stone blocks arranged in 13 rows. The complex Menhir in Carnac has several smaller religious groups of stones, but they are untouched and are in much worse condition. Besides rocks, here can be seen several mounds, like Saint-Michel. It was built sometime between 5000 BC and 3400 BC and acts as a tomb for senior people.